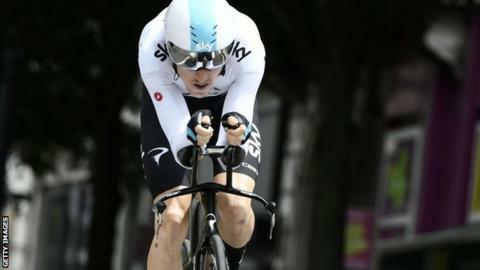 Britain's Geraint Thomas recovered from a crash on the opening time trial of the Criterium du Dauphine to finish 21 seconds adrift of Team Sky team-mate and winner Michal Kwiatkowski. Thomas, 32, crashed on a right-hand bend on the 6.6km prologue in Valence. Poland's Kwiatkowski crossed the finish line in seven minutes and 25 seconds, one second faster than Team LottoNL-Jumbo's Dutch rider Jos van Emden. "I know that [Geraint] can fight for the win," said Kwiatkowski. "Both of us, Geraint and myself, have come here to see how the shape is growing before the Tour de France and it's of course my advantage to win the prologue but the harder stages are at the end of the race. "There are some hard mountain finishes and a team time trial. For sure, we're looking forward to race hard but at the moment I just want to enjoy this victory." Team Sky's Gianni Moscon finished third, three seconds behind Kwiatkowski. The week-long race is regarded as a good indicator of form ahead of July's Tour de France. Britain's Chris Froome has won the race on three occasions, each time going on to win the Tour. However, he is not racing this year, having instead opted to compete in May's Giro d'Italia, which he won. The Criterium continues on Monday with a 179km race from Valence to Saint-Just-Saint-Rambert.